ARCATA –The year was 1985, the owner of an upstart Mexican Jewish bagel shop in Arcata, took an old wooden sign, attached a metal hoop and mounted it on the side of his building. He grabbed his worn basketball from the back of the shop, took off his flour encrusted work shoes, laced up some black and red Converse high tops and set out into his parking lot on I Street with determination in his stride, a gleam in his eye and a mean jump shot. Thus, the basketball court in the parking lot of Los Bagels was born. Over the ensuing years, this court has played host to thousands of formal and informal basketball games. If the red painted walls of the court could talk, they would speak of momentous victories, painful defeats and all the blood, sweat and tears that have been shed, purely for the love of the game. On Saturday, June 25 and Sunday, June 26 this legendary court will once again be the site of a basketball showdown, the likes of which have not been seen in Humboldt County for about five years. The Los Bagels 2 on 2 Benefit Basketball Tournament returns to its’ home court after a five-year hiatus. The tournament started in 1993 as an informal group of players decided to put on a competition and use it as a fundraiser for a kids’ camp in the Trinity Mountains. It immediately became a staple of the Humboldt County athletic scene, drawing players from all strata of society, from high school and college players to working professionals, peace-loving hippies and basketball fans of all shapes, sizes and colors. Dennie Rael lines up a shot. The tournament is double elimination round robin format, and for the first time since the tournament began, will have both men’s and women’s brackets. The number of teams in each bracket will depend on how many teams sign up. The cost per team is $30 and includes two limited edition t-shirts. At a certain point the brackets will close, so do not hesitate if you plan on entering. The games will be to eleven points, with each basket counting for one point. Teams must win by two to eleven or by one to fifteen. This fast and furious style of basketball sets the stage for great competition and epic drama. The great equalizer of the tournament is the combined height rule. The combined maximum height for the men is 12 feet 2 inches and 11 feet 6 inches for the women. Teams will be measured before playing, and the action will start at 11 a.m. Saturday, June 25 at 1061 I St. The original backboard was literally an old painted plywood Los Bagels sign, on the eve of the 5th annual tournament in 1998, a new glass backboard was installed. This change in equipment created a tumultuous tourney in 1998, since so many players were accustomed to the sluggish thump of the ancient wooden backboard. This new backboard was procured from the Centerville Beach Navy Facility, and still stands today. All the proceeds from this event historically support Camp Unalayee in the Trinty Alps Wilderness area. The tradition continues this year, as the money raised goes directly to the Camp Unalayee Scholarship Fund. Founded in 1949, Camp Unalayee’s mission is to bring together children from all walks of life to learn the lessons of respect for nature and community, as well as sharing the joys of camping and backpacking. The scholarship fund helps send children to the camp whose families don’t have the financial means to cover the cost. Camp Unalayee organizers strongly believe money should not get in the way of a young person attending the camp. For more information or to apply to the Camp Unalayee visit their website at www.unalayee.org. The roots of Camp Unalayee run deep through Humboldt County. Dennis Rael both the founder of Los Bagels and the host of the 2 on 2 Benefit Basketball Tournament was a camp counselor starting in 1972. In later years, Marsha Lenz, owner of Folie Douce was a counselor, as well as current Humboldt Supervisor Mark Lovelace. Tom Marquette, the Trinidad Fire Chief, is still involved with the Camp volunteering yearly as their medical officer. 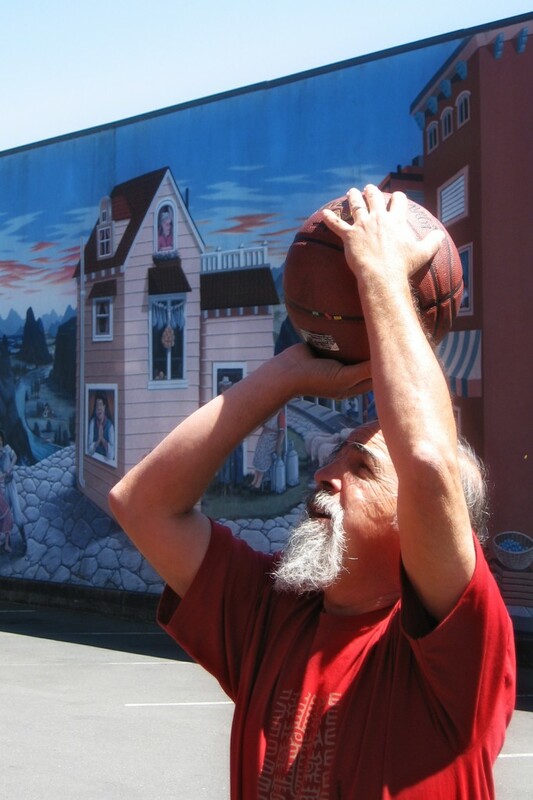 Instrumental in starting the 2 on 2 Tournament in 1993 was Lowell Fitch; he has been the director of the Camp for the last 20 years and has perhaps the most feared three point shot in Northern California. His enthusiasm for the sport of basketball spilled over into his love of Camp Unalayee, and he can truly be credited with being the inspiration for this event. Many of the original organizers are back on board volunteering to bring the tournament to fruition for the 13th time. Dave Deyman, Kiah Ginsberg and Jess Bareilles are working diligently behind the scene to bring off what will certainly be the best tournament to date. What is at stake besides bragging rights for the whole year? Prizes baby, heaps of prizes. The community support for this event is outstanding. At least twenty local businesses are generously contributing prizes ranging from gift baskets to gift certificates, the organizers of the event have about $900 worth of prizes stashed in an undisclosed location. These prizes will all go to the participants, with special prizes for merit, or lack thereof. In cash donations for Camp Unalayee, organizers have also raised over $1,200. As the host of the tournament, Los Bagels sees this event as an extension of their philosophy of supporting community organizations. This tournament is similar to the “I Street Block Party” which happens every Labor Day as a fundraiser for the Arcata / Camoapa Sister City Project. These events start with a couple inspired people doing some grassroots organizing and then mature into a true community event which not only raises money for a worthy cause, but makes living in Humboldt County a richer experience. Everyone is invited to sign up for the 2 on 2 Benefit Basketball Tournament. Go to the Arcata or Eureka Los Bagels, or e-mail bill@losbagels.com to get a registration form. Even if you don’t play, this is a great event to watch, so feel free to stop for some great basketball and be a part of the fun. This entry was posted on Friday, June 24th, 2011 at 5:22 pm	and is filed under Community. You can follow any responses to this entry through the RSS 2.0 feed.